The next train station is "Aachen-Rothe Erde". This station is accessible by regional trains from Cologne and other cities. From here take the bus no. 66, heading to "Parkhaus/Schmiede, Monschau" and exit at the "Flora Monschau". From here walk 300 meters to the center of the town. Take the highway "A1" and exit at "Wißkirchen" (exit no. 111). From here follow the signposts. Parking possibilities all over the town. Tip: take the parking garage at the Rathausplatz. From here just walk a few 100 meters to the center of the town. From the train station "Aachen-Rothe Erde" take the bus no. 66, heading to "Parkhaus/Schmiede, Monschau" and exit at the "Flora Monschau". From here walk 300 meters to the center of the town. Monschau is a small town in the midst of the Eifel area, not far away from the belgian-german border. It's located in the nature park High Fens – Eifel and its city center is really a feast for the eyes! Timber framed houses one after another - this is the historic city center of Monschau in the Eifel. Especially the so-called "Red house" is well worth seeing. It's the former headquarter of the cloth manufacturers family Scheibler, and today it's a museum presenting especially the middle-class living circumstances and culture of the 18th and 19th century. The town itself is located at the Rur (don't cofuse this river with the "Ruhr" - these are different watercourses). The Monschau castle is located above the town and above the Rur valley. Originally it was built for the dukes of Limburg (today in the Netherlands), nowadays a youth hostel can be found here. Alltogether in Monschau more than 300 landmarked buildings can be found, so a walk through this nice town is eye candy! Entire streets of houses - no, the entire city core is one historical monument. It's so nice to be there - the enthusiasm doesn't know any bounds. A visit in Monschau is definitely worth your while! The summer and winter sport center "Monschau-Rohren" offers 4 slopes plus 1 downhill run through the forest (not prepared). There are 4 lifts, a ski school as well as the possibility to rent the equipment. Cross-country skiing is possible as well. During the summer there is a summer bobsleigh run, more than 1 km long. The "Brauhaus Felsenkeller" is a more than 150 years old brewery in Monschau. The brewery was closed for a couple of years and was converted to a brewery museum which is still existing. Since a few years there is a new brewery in this building, additionally to the museum. Walkabouts through the brewery and the museum are possible. The "High Fens – Eifel Nature Park" (german: Naturpark Hohes Venn – Eifel) is a nature park crossing the german-belgian border. It has a total area of 2,485 square km (which is 959 square miles). The major part of the High Fens is located in Belgium, but it's just a stone's throw from Monschau to Belgium. The High Fens consists mainly from moorland and forest and is a very good hiking area. Visit the historic Mustard Mill in Monschau. Mustard is one of the world's oldest condiments. Apart from adding flavour to meals, it is known to aid in the digestion of many foods. In the shop, which is open daily, enthusiasts and fanciers of the spicy grains can choose their favourite from among 18 different mustard varieties. 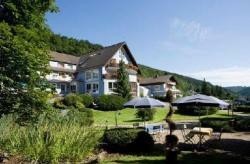 We are a 3-star-hotel with 14 double rooms and a suite with whirlpool in the heart of Monschau. The house is over 400 years old and has an old vault as restaurant, as well as a wine cellar for approx. 60 persons.